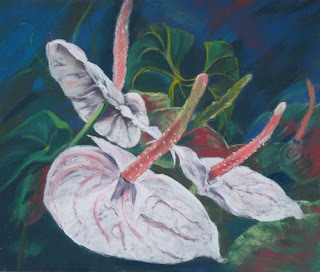 Another anthurium painting from photos taken at Parc Pheonix in Nice. The unique shape of anthuriums always make them interesting to paint. I combined this with another of my favourites - painting on black. In this painting the flowers live up to their common name of 'flamingo flowers'.